1. When one of your real life friends asks you about your last race (or anything significant you've done) and you think, "What? Didn't you read my blog?" 2. When you genuinely get excited every time someone pins something from your blog on their Pinterest fitness board. 3. When you do something, not for the the experience, but because it would be good blog content. 4. If you sometimes feel like your blogger friends are more supportive than your real life friends. 5. If you're an ambassador for at least three things. 6. When your friend shares another blog on Facebook and you get jealous. 7. If you take pictures of random things, just in case you decide to blog about it later. 8. If you take a picture of nearly every meal you eat. 9. If you're a bit anti-social in real life, but a master at social media. 10. If you race home after a race so you can blog about it. 11. If your mom reads your blog to see what you've been up to. 12. If your husband is your unofficial (unwitting) blog assistant. 13. If you can't run with friends without an Instagram shot of your running shoes afterwards. 14. If you start writing your race recap post in your head during the race, predicting the outcome and the blog title. 15. If you frequently have good mail days. 16. If after every workout you run home to record it on Twitter, Instagram, Facebook, and Dailymile. 17. When you talk about SEO to non blog friends and their eyes glaze over. OK, when you talk about any blog topics to non blog friends and their eyes glaze over. 18. If your husband tells you to stop messing around on Facebook and you respond with... "I'm working!" 19. When you feel like a local celebrity when someone recognizes you (or your dog) at a race. 20. If you don't really remember what you did with your free time before you starting blogging. 21. When a co-worker catches you taking pictures of your baby carrots at your desk and you don't feel like explaining. Hey bloggers, do you have any to add to my list? Leave them in the comments! Ha, these cracked me up. I love the one about your husband becoming your unwitting blog assistant. I always joke with my fiance that he is my blog's creative director and photographer! Your post put a huge smile on my face! I love it!!!! I could have put a check next to nearly all of these. One that I would add, (because of me recently). When your co-workers hear you talk about blogging so much, they ask you to help them get started... Then they create a blog and ask you, now how soon before I make a lot of money on it.. LOL, I tell them, when you figure that out, let me know:) I am going to re-tweet your post, others will love this too!! HA! I can't go anywhere without taking a picture. A workout totally doesn't count without a picture of my polar calorie count! Yes, Yes, Yes AND Yes! 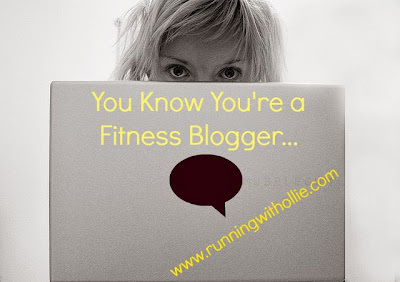 Even though I am not a fitness blogger, I can relate to so many of these! ha ha Mary. You're right. Most of these apply to any type of blogger! This post is so spot-on! I can certainly relate to not necessarily a race recap but just an event recap of any kind and composing it in my head DURING said event. Or taking a picture during the event just because it'd make a great blog photo. Oh, and good mail days are SO fun. Number 14 is definitely me. It helps keep my brain occupied. So funny! I identified with almost all of them. :) Fun post! I love this! And yes I agree with most of them!!! Haha this is so me! Especially #7, #14, and #18! My eyes still glaze over at SEO! I want more 'good mail' though, so maybe I need to know more about it. Great post!! And so true!! My favorite is doing something just because it would make a good blog! Haha!! Love them all. I have to add one about kids. My gang knows we take a lot of photos during races, etc., so at each mile marker they'll stop and I'll count, 1, 2, 3, and on 3 they give me their signature poses! So fun! I'm not a fitness blogger, but I can definitely relate to A LOT of these! oops. sorry! I don't know what I did! bahahaha I think these relate to even non-fitness bloggers!! So true!! O my, so funny! I was just thinking last night how I would spend my free time if I didn't blog!!!! Many of these are true for me! I could add: if you memorize when and what you ate during a run just so you can blog about it. Mine would be "If your friend says something funny during a race that would make the perfect blog title and you repeat it over and over again so you won't forget!" Love this list.